Stop by a tackle shop and get a 2 hook bottom rig and a few gold hooks and some shrimp about 2 oz of lead that should get you started. I would start with at least a 9 foot rod for throwing lures 10 foot will be better, and as light as you can afford, If your throwing a lure all day you want a light rod believe me. Graphite is preferable but graphite composite is doing well these days. I like the saline-x It is a medium priced rod that most can afford. However if money is no problem, I would go with a St. Croix or a Break Away Rod. I have found that the more you spend the farther you get. The reel should be a fast retrieve reel with 12 lb test line. When retreating a lure for Spanish you want to go as fast as you can . Right now every one is using a Sting Silver lure or a Hopkins, check into a local tackle shop to see what color is best. Again, every thing changes every day so saying one thing will work today might not work tomorrow. So checking into a tackle shop will help you. Now that is what you need for throwing a lure for Spanish Mackerel or Blue fish - the most popular fish down there. But the big ones are caught in the fall. Theses fish are around most all of the year but the spring and fall you will find the big ones although the big ones can not be kept. There is a slot size on the 18 to 27 inches The are usually night feeders and so that is the best time to fish for them although I have caught them most any time of day. My favorite time to fish for them is around sun set. I use a fish finder rig or drum rig, Found in any tackle store , Using cut bait, or whole finger mullet. I have been using circle hooks this past year and I really like them. They prevent a gut hook and almost always hook them and any fish in the lip. The only draw back I have found that if you loose tension on your line they might get off but as they say “tight lines“. Drum can be found some time close to shore or close to the sand bar they cruse to edge of the bar as well as the shore line looking for food. So some times a long cast is needed. Here are some hints on throwing to the bar. First off you need to judge the currant and be aware of who you might be fishing close to as lines drift and tangle in a heavy currant and if the guy next to you hooks up and is tangled in your line you might have it cut if you don't do something about it right away . This is important if you are fishing Cape Point. As there is an etiquette there especially during a time when the drum are prevalent. But that's another topic I will cover. They are important if you are throwing 4 oz or more for distance. They will prevent you from throwing your rigs away , they are easy but might take a little practice to tie on your line. But well worth the practice . A shock leader is a heavy line I use 40 pound test or more. 50 is recommended by most. It needs to be twice the length of your rod and 3 turns on your reel, What this is going to do is increase the strength of your throwing line as the end of you line is the one that takes all the pressure, below you will find a site to show you how to tie it on your line . Also if you look around the same site you will find how to do long distance throwing , There are several ways, I have yet mastered the pendulum method but have seen it done and it works well. A nice mornings catch. Blue fish. Now bait is a good subject I like to talk about. My preference is finger mullet. But there are a lot to choose from. I like mullet because I use a throw net to catch my own If you have a cast net bring it cause the best bait you can use any time of the year is fresh LIVE finger mullet minnows. Now if you buy them already on ice look at their eyes you can tell if they have been out of the water too long if their eyes are cloudy. This you will learn with experience. Also smell them. If they smell too fishy that isn't good either. That goes for shrimp too. A good all around bait is squid . Its cheap. Slice it up one side of the tube lay it out flat and cut strips out of it, Menhaden (or fatback...or bunker as it's called down there) and butter fish are good too but I only like them if I'm fishing for drum, because I find menhaden don't last too long on the hook. Blood worms are good in some cases but I feel that they are over priced and I can do just as well with small pieces of mullet. Again, that's just my opinion. I find the northern tackle shops will try to sell you whatever is getting old to get rid of it if you appear to not know what you want. Its a business, and like any other business, they need to rotate stock. If they find a sucker, they will get rid of what they have on hand. There is a lot of competition on the northern beaches, so buyer beware. However I find most shops will not steer you wrong for every thing else. They want you back and would like to hear what you did. 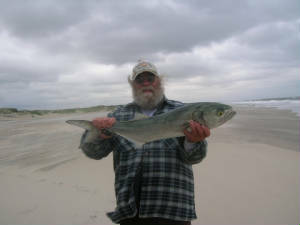 Cut bait can be any fish you like but the best for the outer banks is mullet . 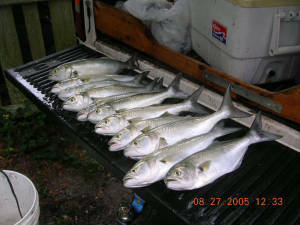 Also menhaden or butter fish can be used But mullet seem to be the best one in my opinion . I have also used Lady fish too They look like a blue but have big eyes, their meat is like fat and full of oil. They are a good choice if you catch one. 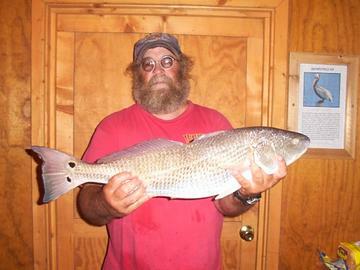 My number one choice is mullet either big whole mullet or finger mullet you can get a fillet of it is called cut bait. How do I cut it. If you have bought the bigger ones I would scale them and just as you do when you fillet a fish start a cut down the back bone and you can either cut it all off or just what you need. I will then cut chunks from that usually across the fillet. Depending on what you are fishing for is how big your chunk should be. The bigger the fish you looking for the bigger the chunk. Keep the unused portion in a air time bag on ice if you let it soak in your ice water it tents to was out and loose some of it's oils and that is what you dodn't want to loose as these oils help attract the fish. This is also why you should change your bait every so often too. I don't fish the same bait more then 30 minutes at the most. If your fishing a whole finger mullet that can go to more thin a half hour if it last that long. You can do this with finger mullet too but you will only get 2 to 4 peaces of cut bait from a finger mullet after you fillet it cut it length wise , again depending on what your fishing for. I find small pieces of mullet about the size of a finger nail will work well for pompano spot and croaker if they are present. As I said before if you are buying mullet or any other bait fish look for clear eyes if the eyes are cloudy they are not fresh also smell if they are real pungent then I wouldnt buy them . same with shrimp . if it smells bad it isn't . fresh fish dont have much smell. Save some money and learn how to throw a cast net. It's not hard and you will have as much fun throwing one as you will fishing. Looking for bait with a cast net will take some knowledge. Know where and what to look for but once you master that you will enjoy it as much as you do fishing. The sound side seems the best area to look but the inlets are good too. Watch for jumping fish ,ripples on the surface when the water is calm. You also can watch the surf when fishing. As a wave breaks look threw it to spot fish. It take a bit of training your eyes as to what to look for but in time you will learn. I have found them just walking in the shallows on the sound side . It's good to have a helper along with you to carry the bucket . Don't put much or any water in your bucket they will jump out if you do and Finger mullet will not stay alive long any way . If you don't have a helper and you leave your bucket on shore watch for birds they will pick you clean if you don't keep shooing them away. I will some times throw them the fish I don't want like pin fish if my catch is abundant. It keeps them busy when your throwing your net. A top to you bucket will help here too or just a wet rag draped over it. Here's where to fish for flounder: INLETS! The flounder prefer sandy bottom. Everything else can be found in beach sloughs like you find in bends in narrow river channels. Watch for breaking waves well out of casting distance with breaks that dont have much breaking waves in them. These are the cuts that form the entrances and exits of the sloughs. Fish just inside the cuts on the down current side of the outer bar. The cuts are best detected and spotted at low tide. This is also a good time to cast net bait. Then when the tide turns and starts coming back in its time to go fishing. Basically, a two hook bottom rig works well for everything you just need to change the hooks, bait, and sinkers depending on the conditions. You never know what they are so just go prepared , with plenty of lead and hooks. There are a lot of people that will tell you the best time of day is an hour on either side of the tide. I have herd early morning is best. I have herd dusk into dark is best. Well the fact is the best time of day is when the fish are there and as we all know its called fishing not catching so you get what you get when you are there. I choose my fishing time according to the weather. and the season. Summer time early morning up to about noon works for me. the after noon sun seems to slow the fish and the beach goers are plentiful and its can be hot. So around noon I usually head in for some lunch and sight seeing or a nap what ever floats your boat, I return after 4, that when the beach swimmers and beach goers go in for dinner and I will fish up to dark. Summer catches consist of small bottom dwellers. As well as top feeders like Blues and Spanish Mackerels. Typically the fall is when the bigger fish are there. Drum is always the target in the fall and I have caught them all times of the day. However the evenings into the night will bring the bigger ones . Since drum have a slot size. 18 to 27 inches and I am a meat fisherman I prefer to keep them in that slot size so I can keep one. Most of the fish have size limits and total day limits so get a copy of regulation at a tackle shop or one of the NPS centers. 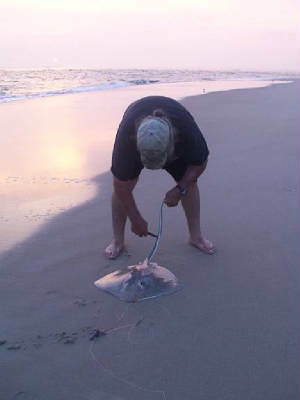 After dark will bring in the bigger sharks and sting rays so be ready for them. Blue fish and Spanish will usually hit in early morning and late after noon. You can see them jumping usually so keep an eye out for them and be ready to go because they will move rapidly up the beach many times. Its nice to have a designated driver when this happens so you can fallow them. However this isn’t always the norm some times they will hang around for several hours. 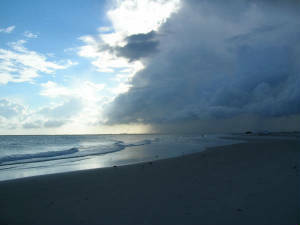 when driving down the beach look for large groups of people throwing lures that is usually where they are. Summer fish you can expect are flounder spot, croaker,Black drum, sheep's head sea mullet, blow toads, lizard fish, pig and pin fish, Cobia if you are lucky sharks, skates, and rays, Blue fish and Spanish Mackerel. 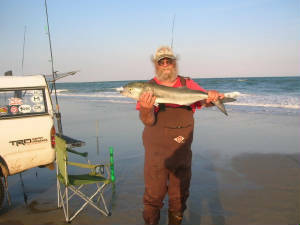 If you know how to fish from piers for King Mackerel, they can be caught too. now that's another subject and I never got into to it, although I do know a little about it. Its expensive $1400 on average for 6 people plus a tip for the mate. I have never gone off shore on a charter but I have on a head boat. On a charter they will customize the trip as to what you want to fish for . They will recommend what to fish for or what is good to fish for but its up to you to decide . You can go trophy fishing. that would be for marlin or sail fish, ones you dont keep or you can go meat fishing. This is the kind you bring home. Meat fish there is Tuna Wahoo, King mackerel bull head dolphin. not to be confused as bottle nose dolphin like flipper. and many other varieties all good to eat depending on the time of year you go. You need to look into marina near where ever you are staying to book a trip. On the charter they will take only 6 people weather they fish or not. You might want to do this a month before you go down in the summer they book heavy and it all depends on the weather too. Head boats are cheaper and depending on what kind you take as to what it will cost you. 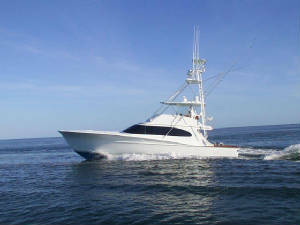 They have 1/2 day trips or full day trip in shore or off shore or wreck fishing. I would recommend the off shore or wreck fishing. Not sure what they run now but it should be under $ 100 a day per person. 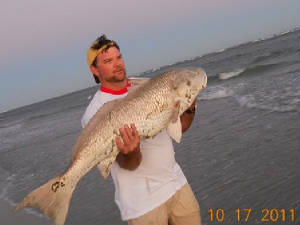 I find the 1/2 day inshore trips yield about the same as you would catch off the beach and in many instances you will see them just out side of the area you are fishing if your fishing in an inlet however a day at wreck fishing will usually yield a variety for fish and a chance for some bigger ones too. Some captains on the head boats will allow you to drag your own rig from the stern of the boat going out to the wreck but you need to check with the captain before you do this, Bring along a lure on a long leader, it will not hurt to ask. The first mate is really the person who is going to be interacting with you the most on the charter. he/she will rig and bait all the gear, offer instruction and assistance. To fish the sound fishing above the Wright Memorial bridge requires a fresh water license. It is considered fresh water. 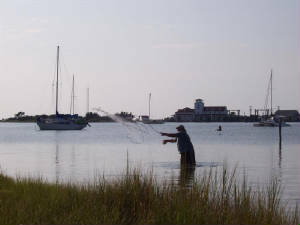 So if your in Duck or Corolla you will need a fresh water license to fish the sound legally Most sound fishing is done from a boat in channels or around structures or from the bridges going to Manteo . If you have never been here the sound is very shallow for a long ways out some times a half mile or more . You will wade in water only up to your knees and there are all kinds of grass and yucky stuff you will have to wade threw. Not to say all of it is like this but the majority of it is. 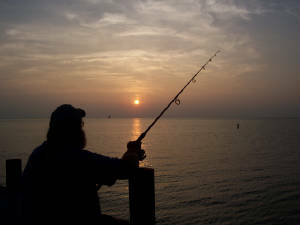 The fishing is usually best near the channels where the water is deeper. There is a place south of Avon called Haul over area, Also known as Canadian hole. A great place to wind surf and take the kids there is little currant there and a great place for kids to play in the water and also deep enough to do a little fishing. Most of the fish here are also little but fun to catch with kids. The best place to fish the sound is at an inlet. Oregon inlet bridge has cat walk you can do this from.It is free. You will need to check what way the current is running to fish from the bridge . Almost any thing can be caught from the bridge. A good place to fish with kids although the cat walk is a bit narrow it is safe . Sorry folks it seems the beaches are getting too crowded with vehicles and they are afraid that this is going to push over into the nesting area, Not my opinion as we have always respected closures , I hope this will change soon. Cape Point is a special place found just below the Hatteras Light house and only accessible by 4 wheel drive or a long walk . 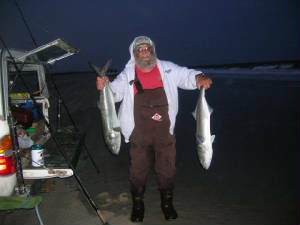 It is a great place to fish but it can be a challenging or dangerous at times, when the blues and Spanish mackerel are there you will find shoulder to shoulder fishing with lures and you will need to watch you step as some anglers don't pay attention to what is in back of them in the heat of at furry. I have seen people hooked. How ever it is exciting . Not only to fish but to watch too. Bring a bucket or a chair and some one to watch it too if you can. Sit and watch for a while most of the action will be right at the point and parking will be limited so you might have to take your gear 100 yards from your truck or SUV , In recent years there have been some thievery there so be warned. The point is also a good place for the family as inside the hook you will find calm waters for swimming just stay away from the point. When the drum are there you will need to watch your self as most fishing is done after dark you will need a head light for your self . Watch what is going on as heavy lead is being thrown . First thing is if you show up after dark never shine your head lights on the water, If the drum are schooled up and you shine your lights on them they will scatter and the fish goes to hell for every one. I have been told that this has been done and the culprit that did it was punched in the face by an outraged angler . I'm sure that was possible as there are to many serious drum fishermen . If you decide to get on the line with every one else ask what manners you should fallow , but here is what I have found, When any one throws you drop your rod as to give him room. Once you are any one else throws they well drop there rod and shake it and ask the guy next to you if they can feel it if so you or he will need to move. As your lines are crossed. You will not need to pull up your line just adjust your position . This you will learn in time. The best advice to fishing Cape Point is to watch and observe first . It will take some time to learn to fish the point but it will be productive if you don't mind fishing in a crowd. It is also referred to as combat fishing. Good luck. 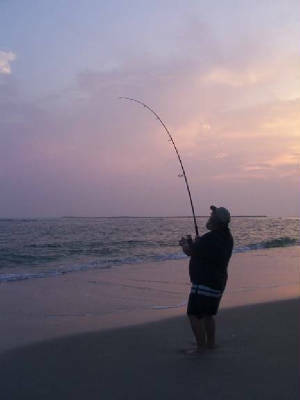 Most of the best places for fishing are accessible by 4 wheel drive only or a long hike on foot. However there are plenty of places to fish with out the luxury of 4 wheel drive. 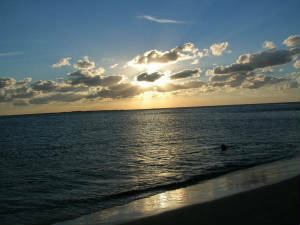 There are many walk overs with parking lots that you access the beach. Before I had 4 wheel drive that's what I did. There is the Oregon inlet bridge cat walk its free and you enter it from the south end of the bridge. Also on the way to Manteo there is a small bridge called just that ,and is some times productive. Under the bigger bridge there is also a free fishing pier with handicap access. You can get there across from Pirates Cove Marina. Look for the access road. Of course there are the numerous piers that are always productive. you can visit a pier for a dollar and if you want to fish after visiting they will put that dollar towards the entry fee. Piers have a rod limit for patrons but they also rent them if you don’t have one as well as every thing else you need. Some are handicap accessible too. Sea weed or sea grass is just something you have to deal with some times it is so thick that it is imposable to fish. However if your in a 4 wheel drive don’t give up yet. When I drive down the beach I look at the area under every ones sand spikes. if there is bunches of sea grass under it is a good indication as to what they are reeling in. I try to avoid that area and move on. But as do fish so does sea grass move . Many time I have found it on the beach but not the inlet or visa versa . I’m not sure what conditions cause it but moving around the beach will help you find a good spot. wait a few minutes and see what’s going on as far as sea grass. I drive my family crazy moving up and down the beach finding a place but that's the breaks of the game. Sand spikes: They are available everywhere even at K -Mart but I find then to be very weak and will not dig into the sand very well. I use a home-made one made out of PVC pipe. It's much stronger and you can use it to dig in really good by moving it back and forth. A good setting on your sand spike is important if you hit a big sting ray. They will take your pole right out of the spike if you're not dug in well. I will use the store bought ones but I'll dig a hole with a home made one first and stomp it down real good. There are other kind available but this is what I use. Some you can get them with a bait holder and or drink holder too Remember that open cans of beer are in a vehicle are against the law . They are cracking down on this now a day too Bring an assortment of buckets, a good pair of needle nose pliers, a long narrow cutting board for bait, a good fish scaler and plenty of cold drinks for the hot days. You also might just want to pack something for night fishing too! a lantern, some flashlights glow sticks for your rod, These can be taped onto your rod tip to let you know of you have a bite at night . Also a head light like the miners use. All of you fishing doesn't need to be long distance many times you will find them right at your feet. Pompano will be just off the beach and flounder some times you step on them. So don’t think you need to throw your rigs a great distance But of course there are some instances that you want to throw a long ways. here's a site that you can go to that will give you instructions on how to do just that. But bottom line is you got to practice . some thing you can do at home. A towel is good to have too not for what you think . In the event that a gull might fly into your line and get tangled, Throw a towel over its head and hold it down, once a towel is on their head they seem to calm down enough so you can remove the line , they usually get pretty wound up in it too. Cut you line if you have to but most of the time you can untangle it with out too much trouble. With this in mind and to help avoid this don't throw any bait scraps near you lines . They tend to swoop down and retrieve them and a good chance to get tangled. This is important to know . You can drop a line any where but you have a better chance if you know where to drop it . Slues are deep holes between the beach and sand bar inlets are holes in the bar where the fish will come into the slue These are area you want to know how to find and fish in. Finding them takes a little experience , the best time to look for them is at low tide they are seen much better at this time . Watch the waves and look for an area that the waves don't seem to be breaking on the sand bar that will be a inlet. Most beaches have a sand bar just off the beach the area between the bar and beach will be a slue, look for slues that have flat water or very little wave action in the middle they are the deeper ones. The fish tend to look for food along the inside of that bar so that is why you want to be able to throw that far . Although they will also cruz the deeper area too so you got a chance almost any where . Some of the smaller fish will be right at your toes so just a flick into the surf will give you a chance at pompano or spot and croaker. Now if you don't have the equipment to throw that far I have seen people incorporate a friend in a paddle boat like a kayak to take them out for you , But that's a lot of work for what you get . I always say do what you got to do.. I have also herd of people using potatoe guns too to get their rigs out . I know nothing about them I stick to good gear and the knowledge of throwing. This is why you need to dig in that sand spike. King Mackerel off of the piers takes some knowledge and special equipment, First you need a rod that can throw a pound or two of anchor with 100 pound test. then you need a second line with a quick release clip on it,a stinger mackerel rig. and a third line to catch small live fish for bait and a live well.. A cart to take all of this out on a pier plus a cooler with drinks and food. This is not for armatures but if you get the chance, and you hear they are biting stop buy a pier and check out how it is done, it can be very exciting some times. there is also a pier etiquette you need to learn to do this. The advertising on the top and bottom of the pages are put there by Tripod I have no control over them because I don't pay to use this site or do I make any money from this site. For now its free for me and we will just have to put up with the advertising . Tripod has to get paid too.